Based on reviews from 292 experts and 29,989 users. 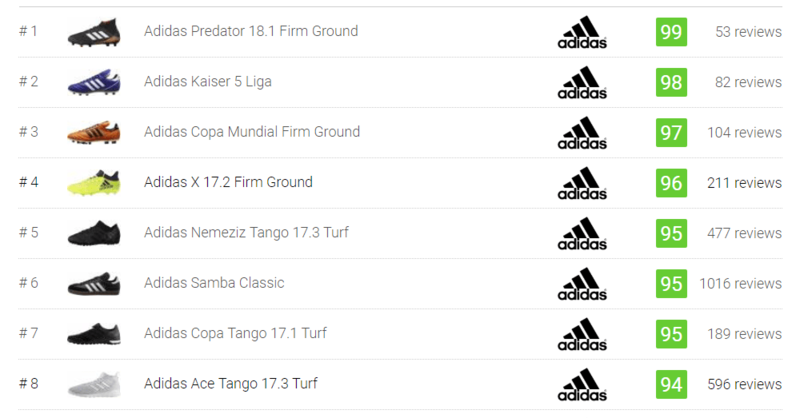 Learn how our rankings work or see our guide to football boots. Updated Apr 2019. Football is one of the oldest and most popular sports in the world. It is a sport that men and women of all ages enjoy playing. Along with its popularity came the rise of different football boots from various sportswear brands. Choosing the right football boot can be a difficult task, especially for beginners in the sport. Worry not! RunRepeat is here to help you find the right pair of football boot whatever your playing position may be. We have spent tons of hours to come up with in-depth descriptions and collate reviews of each football boot from all over the internet. The history of the sport dates as far back as 2,000 years ago in ancient China, Greece, Rome, and some parts of Central America. Older forms of football allowed kicking, biting, gouging and punching. In 1848, the Cambridge Rules were first drawn up. This set of rules allowed forward passes, throw-ins, and goal kicks as well as prevented running while holding the ball. In 1863, a revised set of rules were developed which later became the association football. The international governing body of football known as the Fédération Internationale de Football Association or FIFA was established in 1904. It oversees competitions among the national football associations of Denmark, France, Spain, Germany, Sweden, Switzerland, and the Netherlands. In 1954, brothers Adolf and Rudolph Dassler created the first pair of football boots with screw-in studs. FIFA World Cups are held every four years. Today, more than 240 million men and women from all over the world play football regularly making it the king of all sports. The first fully customized pair of soccer cleat was created following the introduction of laser technology in 2006. Upper - The upper of the football shoe is the top portion that includes the material that covers the foot. It is attached to the sole and midsole. The upper basically includes everything above the insole and midsole. Insole - The insole of the soccer cleat is the inner area where the foot sits. It includes the internal cushioning and support of the shoe. The cushioning inside the shoe or insole can be removable or attached. Midsole - The cushioning system that is built into the shoe. Outsole - The outsole of the football shoe is the outer sole area where you find the studs or spikes. It includes everything below the insole and midsole. Heel counter - This is the back section of the football boot. It provides support for the heel. Vamp - The vamp is the front portion of the upper, also known as the strike zone. It is the part of the upper that makes contact with the ball. Some vamps are stitched while others have added technologies to enhance the shoe’s shot power and ball control. Studs or Cleats - These are the blades or cones on the bottom of the football shoe. They act to improve traction. The stud is often called a cleat. Some football shoes have studs that are fixed or molded on the bottom of the shoe. There are also some football shoes that have removable studs. Typically, there are three types of studs: bladed, hard ground and round or conical. The studs may be made of plastic, rubber or metal-tipped. Last - The last is the three-dimensional foot model on which a football boot is constructed. Generally, football boots in a particular line have the same upper and midsoles. The difference can be found in the outsoles. Since football is played on a variety of surfaces, having the right kind of studs can help you get the right traction on a specific playing surface. Below is a list of the different types of sole plates used for the various playing fields. Firm ground football boots – They are best used on natural grass surfaces. These type of soccer cleats have a series of non-removable studs that are either bladed or conical in shape. Some Puma firm ground football boots also have a combination of both conical and bladed studs. Soft ground soccer boots - Soft ground or SG soccer shoes should only be used when the playing field is soft enough for the studs to penetrate the surface. This kind of football boots usually features six replaceable metal studs - four in the front and two in the back. They have longer studs which add traction on wet and muddy fields. Popular Nike soft ground football boots also have extra molded studs for enhanced traction. Hard ground soccer shoes – Hard ground (HG) football boots are for players who play on sun-baked surfaces or bare fields where patches of grass have been worn away. This type of football boots has lower profiles with many conical studs to help keep you balanced. The outsoles are usually made of durable rubber. Artificial ground football boots – They are used on the newer type of artificial turf fields. The durable rubber studs are well-spread and shorter in length. Turf shoes – Turf field football boots have small, compact spikes that are made of durable rubber. These football cleats are used on old-school carpet-type fields. Indoor soccer cleats – Indoor football boots gum rubber flat outsole with no real studs. They look like lightweight sneakers with their lower profile fit. Football boots also come in three types of ankle heights, namely low-top, mid-top, and high-top. One shoe design is not better than the other. It is a matter of personal preference and how you play the game. Below is a quick rundown of the pros and cons of each football boot based on collar designs. Low-top - A low-top football boot is for the player who always makes quick cuts and changes of direction. It is more comfortable to wear straight from the box because of the absence of the mid-cut/high-cut collar. It is lightweight and allows a full range of motion around the ankle. However, a low-top football boot offers less protection and support against sprains, breaks, and other soft tissue damages. The freedom in motion this boot gives can significantly benefit wingers and forwards. Mid-top - A mid-top football boot offers ankle support while still allowing the players extra maneuverability. This type of boot is best for defensive players because they take in a lot of heat during a game. High-top - A high-top football boot provides maximum support from the base of the foot to the ankle. It also protects the ankle against injuries while doing quick turns and sudden stops. Aside from being an excellent high-top football boot, the Nike Mercurial Superfly V is also considered as one of the fastest boots on the market today. High-top football cleats are best for players who spend more time doing side-to-side movements during the game. It takes more time to get used to wearing high-top football boots because of the firmer heel area and the sock-like material around the ankle. There are hundreds, if not thousands, of football boots to choose from these days. RunRepeat provides you with some of the best characteristics you need to look for when selecting the right pair of football cleat. Fit - The right fit for a football boot should be snug. The tight fit allows the player to have a better control of the ball. Have at least ⅛ to ¼ inch of space between the toe and front end of the shoe. There must be enough space for the toes to wiggle freely inside the football boot. Some companies design women’s football boots to be narrower compared to the men’s versions. Ball Control - Modern soccer cleats have built-in elements that enhance ball touch and control. Examples of which are the stitching and rubber elements on the sides of the upper. Material - The kind of material used for the upper of the football cleat plays an important factor in getting the right fit. Leather stretches and molds to the shape of the foot over time. If you are looking for a durable and comfortable football cleat, then football cleats with kangaroo or calfskin leather upper are your best bet. However, football shoes with genuine leather upper do come with a price. One of the most popular football cleats with a genuine kangaroo leather upper is the Adidas Copa. Insoles - High-end football cleats come with removable insoles. The purpose of which is so that the player can use his/her preferred insole for a more personalized in-shoe comfort. Another benefit of removable insoles is that it can be replaced with orthotic ones for players with plantar fasciitis and other foot conditions. Pricing - A general rule in choosing a football cleat based on pricing is to get the best pair that you can afford. The amount of boot technology found in a football cleat has a direct influence on its price. Copa Mundial - This classic football boot weighs 11.4 oz. It was seen as a boot ahead of its time during its release in 1979. It has a signature K-leather upper and minimal soleplate. It is Adidas’ top-selling cleat of all time. Samba - The Adidas Samba was released in 1950. It is the first soccer cleat created by Adidas. It features a suction design in the gum sole allowing players to train on hard, icy ground. This Adidas indoor soccer shoe is the second highest selling Adidas design. Nemeziz 17+ 360 Agility - This is one of the first laceless boots released in the market. It is also the first football cleat that uses bandages for the upper. It is inspired by ancient ritual of taping for increased strength. Mercurial Superfly V - This Nike football cleat is the fifth installment in Nike’s speed silo. It features a FlyKnit upper with a textured surface. It also has an anatomical soleplate that follows the natural contours of the foot. With a weight of 6.5 oz., it is the lightest Superfly boot to date. Hypervenom 3 - This is the first low-top Flyknit soccer cleat from Nike. It is also the first to feature the NikeGrip insole. Magista Obra 2 - This 7.2-oz. football cleat is built for superior ball control. Its upgraded features make it one of the best striking boots from Nike. Puma King Finale - The soccer cleat was released in 2010 and weighs 9.2 oz. This updated version of the 1968 Puma King has been perfected with the help of Eusebio, Pele, Johan Cruyff, Maradona, Lothar Mattheus, and Didier Deschamps. The highlight of this boot is its leather upper. Puma V1.10 SL (Super Lightweight) - It was released in 2010 and weighs 5.3 oz. It uses an ultra-thin microfiber upper and one piece of Pebax with a carbon fiber inset. This minimizes the weight of the shoe, yet increases its stability. Puma One 17.1 - This soccer cleat combines the best features of the evoTOUCH and evoSPEED but with improved key technologies. It is worn by famous football players including Antoine Griezmann and Hector Bellerin. The sport is officially called Association Football. The significant rise of the Women’s Association Football, also known as Women’s Soccer, happened after 1863. The first Women’s World Cup happened in China in November 1991. While the rest of the world calls the sport ‘football’, the term ‘soccer’ is used in the United States of America to distinguish it from the more popular American Football. ‘Soccer’ was coined by the British during the late 1800s as a slang abbreviation of Association Football. Football is played on a rectangular field that is 100-130 yards long and 50-100 yards wide. Each game lasts 90 minutes long with two 45-minute halves. Goalkeeper/Goalie – The only player who is allowed to touch the ball with his hands while in the goal box. Center-back – This player’s primary task is to cover and mark players in the middle area of the field. Sweeper –This player clears the ball just in case it breaks through the defenders. Fullback – This player assures that the striker’s goals are not negated by the defensive team. Wingback – This player acts as a blocker, receiver, and runner of reverses. They stand toward the edge of the field. They are not allowed to dribble into the center or cross into the penalty area. Midfielder – This player stays in the middle of the field. Defensive midfielder – This player’s goal is to defend the team’s goal. Also called holding midfielders. Attacking midfielder – This player orchestrates the attack and distributes the ball. Also called playmakers. Center-midfielder - This is one of the most versatile positions. This player is responsible for the offense, by creating opportunities for the strikers, and defense, by stopping the opponent’s attacks. Also called box-to-box midfielders. Wide midfielders– This player is the one who passes the ball to strikers who are in scoring position. Also called wingers. Forward – This player scores goals. Center forward – This player scores goals through passes from teammates. They also distract the defense allowing the playmakers, wingers, and withdrawn strikers to attack. Also called strikers. Second forward – This player is the primary scorer, while the person in front of him serves as the decoy. Also called withdrawn strikers or deep-lying forwards. Stopper – This player ensures that the opponent’s most offensive player cannot send and receive passes. Football players used metal tacks on engineer’s boots in order to provide ground traction. In the early twenties, the first pair of football boots with removable studs was introduced in Germany. Football boots used to weigh 500g when dry and twice as much when wet. Manufacturers started making lighter football cleats when they were made aware that the boots only came in contact with the ball for about 10% of the game. Today, the lightest Adidas football cleat from weighs 99g. They used to make football boots using thick and heavy leather made of kangaroo hide. When polymers were developed, natural materials were replaced by synthetics. The new materials are waterproof, cheap to produce, and substantially lighter than leather. The soccer cleat was streamlined with the ankle-hugging component reduced to below the ankle bones. With the development of latex foam, soccer shoes are cushioned with no detriment to overall mass. What is the difference between football and soccer? Football and Soccer are two different words referring to exactly the same sport. The major factors for the variation are geography and language. In the UK and most of the European countries, the term “football” is used to refer to the team sport that involves kicking of the ball to score a goal. It is the sport that popularized players such as Cristiano Ronaldo and Lionel Messi. On the other hand, that same sport is referred to as “soccer” in the US and other countries. The sport has been called “soccer” in the US because of the existence of another type of team sports called “American Football” whereby a player can score through passing of the ball by hand. To prevent confusion between the two team sports, two different terms were created. Now that this has been established, it is always best to know the context of the word to avoid misunderstanding. Do professional player endorsers really wear the same football boots released in the market? When popular professional football players sport blackout football boots in their training sessions, it is often an indication that a new silo is about to be introduced in the market. Football fanatics can’t help but ask if these players actually wear the boots they endorse. More often than not, their football boots are customized to their own liking and specifications. Although it may appear almost identical to what they endorse, the football boots they wear are personalized versions of the market prototype. Given this reality, it is not necessarily bad news. Regular consumers are still guaranteed of football boots that have gone through quality control, at least for the more prominent and trusted companies such as Nike, Puma and Adidas. Some companies also offer personalization when it comes to the design aspect of the boot such as the option to put the text of your choice, choose colors and graphics. As for the fit, several technologies are now available to accommodate to different types of width. These and other more options are just some of the reasons why purchasing the football boots of your idols is still worth the try. What is the difference between football “cleats” and “boots”? A search through the dictionary would tell us that the word “cleat” refers to the protrusions on the sole of the footwear. However, it is more popularly used to pertain to the cleated shoe itself. Based on the term’s popular definition, it is basically synonymous with a football boot. Both terms refer to the same type of shoe. It is also important to note that the two words are also used to refer to rugby shoes with studs.